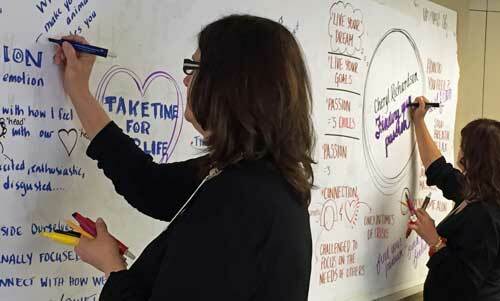 I just finished leading 5 days of beginning and advanced trainings on working visually with groups and individuals (aka Graphic Recording, Graphic Facilitation and Graphic Coaching). As a result, a new cohort of Process Professionals are in the midst of integrating visual skills into their toolkits and practices. Marvelee and Joleyne Doing Their First Graphic Recording … Ever! One of the phrases I use repeatedly in my trainings is “the only way out is through”. Working visually is a distinct skill. Like any other distinct skill it requires work to learn it and to hone it. When you learned how to drive a car it took a bit of time. Well, learning how to work visually is no different, it’s gonna take a bit of time to learn how to effectively drive! For me, teaching visual skills is a fascinating thing; cause SO MUCH goes on at various levels that it can sometimes take people by surprise. Not only is it physical (standing or crouching using markers and pastels on large sheets of paper or whiteboards) but its also mental (synthesizing content) emotional (feeling the tone and atmosphere) and even spiritual (creativity being set free often after years of external and internal repression). Private and public tears are not uncommon given the work lands deep for us practitioners. One dynamic that I sometimes encounter in my visual skills trainings is the tendency for some folks to harshly compare and critique themselves. My heart cringes when I encounter this kind of inner violence and perfectionism– because if a person is doing that in my class they probably do it elsewhere to themselves too. And, from personal experience I know that is an abusive way to live (I lived like that in my younger years before I learned to knock it off). I strongly recommend that you grant yourself a ‘learners grace period’ when you dive into working visually. So many folks have experienced various kinds of creativity and art traumas that it behooves you to cut yourself some slack as you embark on this tender territory. Let yourself to be a learner. Let yourself not have to be instantly perfect on your very first try. Let yourself to go through the steps that it takes to master the craft. If you stick with the steps, and take a compassionate approach to yourself, you will master things before you know it. The only way out is through … and with self-kindness! 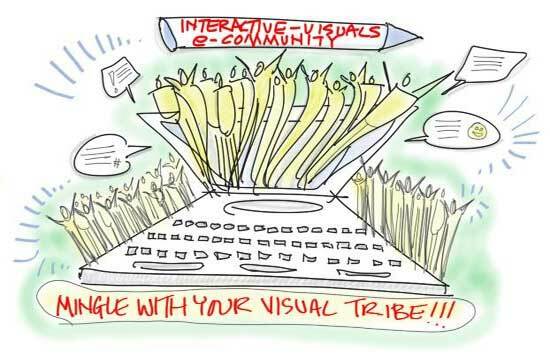 There are MANY simultaneous things going on when you work visually. There’s the juggle of the markers, the selection of colour, the choice of format, the listening and pulling out of the ‘logic trail’, the sketching of appropriate shapes, icons and fonts and the colour layer. 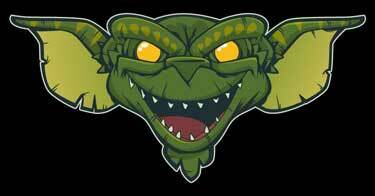 And on top of all that, the managing of group dynamics if you are leading the process too. 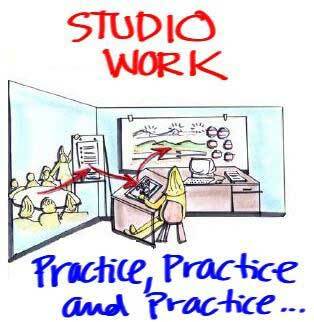 I suggest folks practice, practice and practice — first in the sanctity of your own studio (via studio work and recording drills) and then in safe, supportive live situations. Of the many things going on, focus on just one of two of them at a time in your practice situations. It might be writing in mostly capitals with lower case for supplemental. certain formats until you inherently understand them from the inside out. Or take a handful of icons and draw them repeatedly until you can draw them without thinking … then move onto another handful! If you continue with the drills we discussed and did in class you will be unconsciously competent sooner than you think! Quantum leaps happen for those who do their homework! 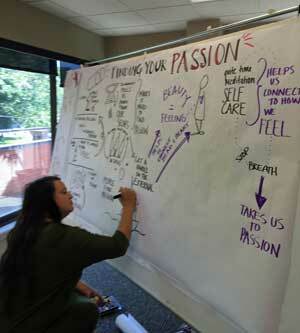 I’m a true Graphic Facilitator … that means I facilitate the process while also capturing the content visually. None of us earning our keep in this work started out perfect (heck, none of us are perfect now!). In my opinion ‘perfection’ is a silly thing to aspire to in work that is live and spontaneous. 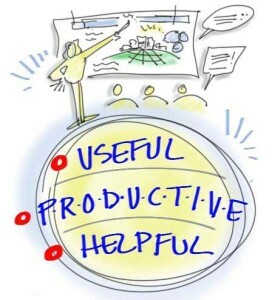 ‘Useful’, ‘productive’ and ‘helpful’ is a more realistic frame. Doing visual process work is about aiding the folks we work with to better see and understand their worlds and themselves … it’s not about producing a perfect piece of art. It’s about doing good enough stuff in the moment that your clients are helped by what they see and by what is mirrored back to them by you. Remember that as a grad of any of my visual programs you are invited to our larger Interactive-Visuals eCommunity — an online forum where you can interact with people from around the world also in the process of integrating visuals skills into their work and life. Introduce yourself, meet others from your region (and also far afield), post your work (we have threads for Studio Work, Graphic Recording, Graphic Facilitation and Graphic Coaching), share tech tips, resources, etc. I also host a complimentary monthly drop-in webinar for this community (next one is this Thursday). 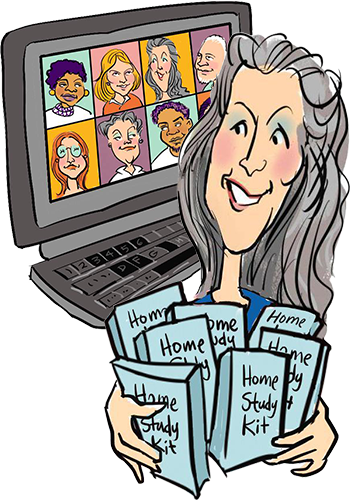 Plus a video library of previous webinars is also available with all sorts of topics of interest to the budding and seasoned Visual Practitioner. You are not alone in your visual journey unless you want to be! 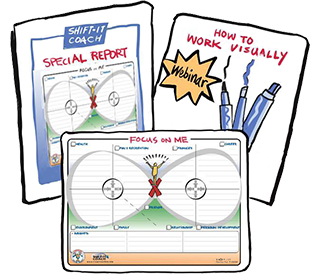 Want to learn how to work visually? It’s a highly productive way to work with groups and individuals and YES, you can do it too! 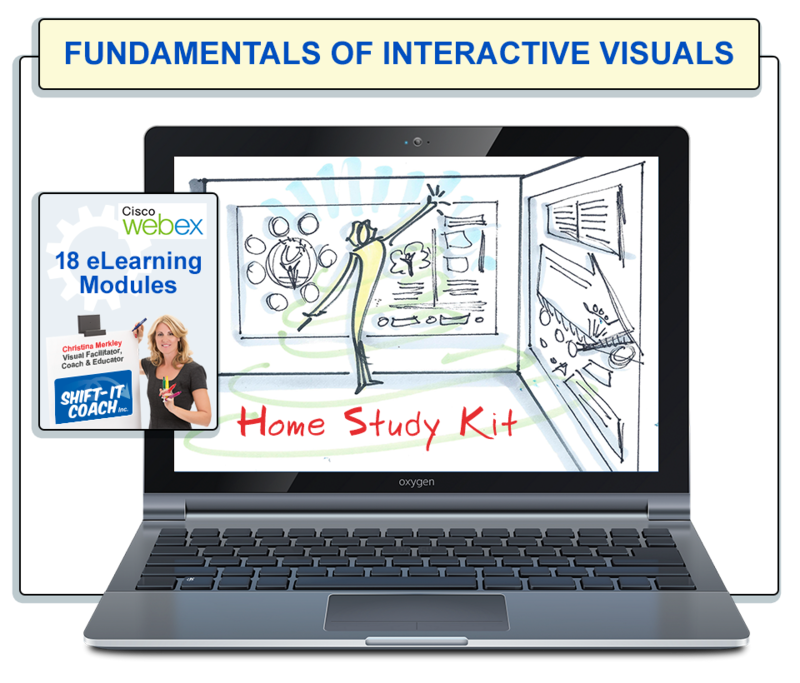 Fundamentals of Interactive-Visuals is offered in various public workshop formats throughout the year (in-person and online) as well as available at any time via The Home Study Kit. Private Trainings also available. Magic Marker Retreats are offered via public workshop once a year in Victoria, British Columbia. Advanced mentoring also available via Distance Sessions or private in-person trainings. Also, should you have several people in your organization who want to be trained, see In-house Workshops.